Home :: SANTA'S GROTTO :: Contorted cherub. We consider that the culprit is an chronic case of colitis.. Possibly glazed plaster of Paris, possibly not. Fingers, toes, nose decidedly chipped……… whatever, who cares……. 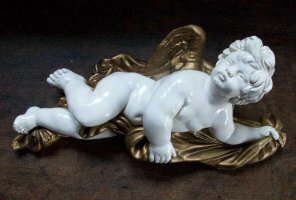 this charming chubby cherub will contribute Christmas charisma to the most cheerless corner.